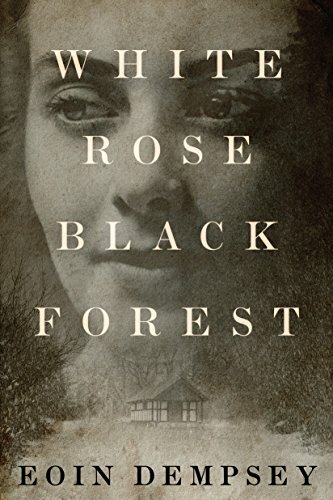 “White Rose, Black Forest” is billed as a historical fiction, but it has all the makings of a thriller. Author Eoin Dempsey presents Franka Gerber with a dilemma right from the beginning, then continues to turn up the heat as the story progresses. Although Franka understands the danger that could come from her actions, she continues to do what she feels is right. The story is told through the eyes of several characters, although Franka is the main focus. While we do learn of some of the motivations of the American John Lynch, it is through Franka’s eyes that readers are swept into a country consumed by conflicting emotions. The author allows her to speak the thoughts that must have been hidden by many German citizens in 1944. Even though her life has led her to her current predicament, everything is still not black and white, and Franka wrestles at times with what she should do. Mr. Dempsey offers descriptive passages at the same time, presenting interesting pictures with his use of words. For instance, we are told a used parachute blowing in the wind is “…licking at the snow like a thirsty animal.” The life-threatening description of the bombing of a German city thrusts readers into the action, and it is hard not to be fearful of what may happen to the people exposed to the possibility of instantaneous death. While I wasn’t always happy with the dialogue (at times, it felt a bit stilted), the characters stayed true to their basic motivations. As stated above, this historical fiction book turns into a thriller. Her choices place Franka in danger as the Gestapo quickly become a larger threat, which pushes the book to a breakneck pace as it heads toward the conclusion. Four stars. WHAT DO WE HAVE? A psychological thriller? A true war story based on facts with fictitious characters? A suspense? Some of all of these. What we have is a mix of storyteller and history teacher with many long expository intrusions, flashbacks and author-voiced settings. DILEMMA. The airman is still alive. Franka is a nurse. Her sense of saving lives causes deep psychological turmoil — let him die, go ahead with her suicide plans — risk her life to save this stranger whom she hates? And then she hears him speak a few words in English! I’M INTRIGUED. Also, the author’s descriptions make me “see.” They’re sharp without being long and add to the depth of the action. PACE — the first half of the novel is the airman recovering from his limiting injuries and preparation to avoid the intruding Gestapo. It’s a bit slow. Then as the Gestapo closes in, the tension becomes more severe. All the previous historical flashbacks deepen this tension. This book becomes a true action novel with a satisfying ending. . RECOMMEND. Even though there were problems arising from the difficulty of the book’s concept, I think it still deserves five stars. This was a quick read, mostly because I couldn’t put it down. The story drops you into World War II and gives you a sense of what it was like in Germany then from one person’s point of view. I believe it is honest in it’s historical accuracy and description of the people and time period. It’s a great romance but the historical part is to me, equally interesting. The story is well written with well developed characters and the story flows smoothly. You can read other reviews that will give the story away, I’m just here to tell you that if you are looking for something to read where the story will touch you and at the end you will say “I’m glad I read this”, give this book a try.